Exactly how you build a season-long fantasy football roster is a matter of personal philosophy. How you do it for best-ball is too, of course, but there certainly is more typical process. In season-long, we can debate whether you want a high-ceiling vs. a high floor, risk/reward, all that. In best-ball, ceiling often (not always) carries the day. So who offers the highest ceilings, and who hits ceilings most often? Below, we’re looking at the players who hit certain thresholds the most often in 2018 (25 points for QBs, 20 for RBs and WRs, 15 for TEs) and how to use them in best-ball leagues in 2019. These aren’t overall the ones who hit the thresholds the most, necessarily, because that list gets fairly predictable. These are the highlights. This can’t possibly be a surprise. The best season-long quarterback is also the best best-ball quarterback. The question of how early to draft Mahomes is a fine one — my guess is he gets overdrafted based on value in 2019 — but the fantasy players who have him are likely to enjoy the experience. 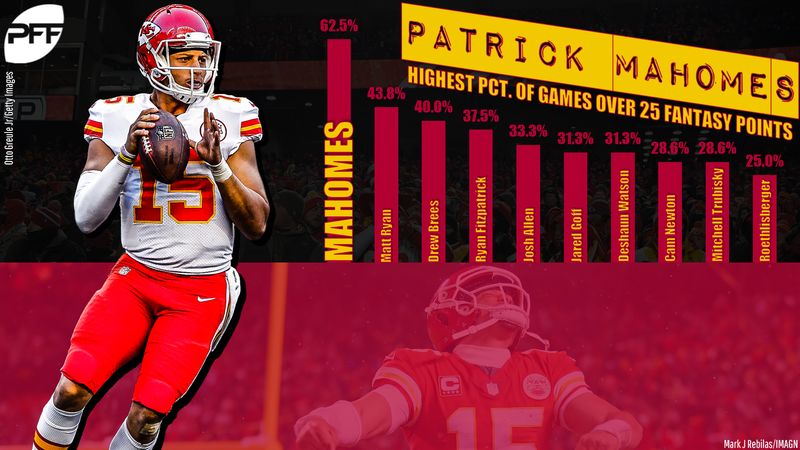 Only Mahomes, Matt Ryan, and Drew Brees topped 25 points more often than Fitzpatrick. We don’t know where the veteran will land for 2019, but assuming it’s somewhere where he has any real shot to start some of the time, his up-and-down style lends him to a deep best-ball pick. Until he’s on a roster, though, this doesn’t really help us. Allen’s numbers are even more interesting if you separate them pre- and post-injury. Before he got hurt, he topped 25 once in six games, then did it three times in six games after his return. If post-injury Allen, who topped 90 rushing yards in four different games and scored five rushing touchdowns, is the type of quarterback he is long-term, he’ll be a fascinating fantasy quarterback no matter the format, but especially so in best-ball leagues. 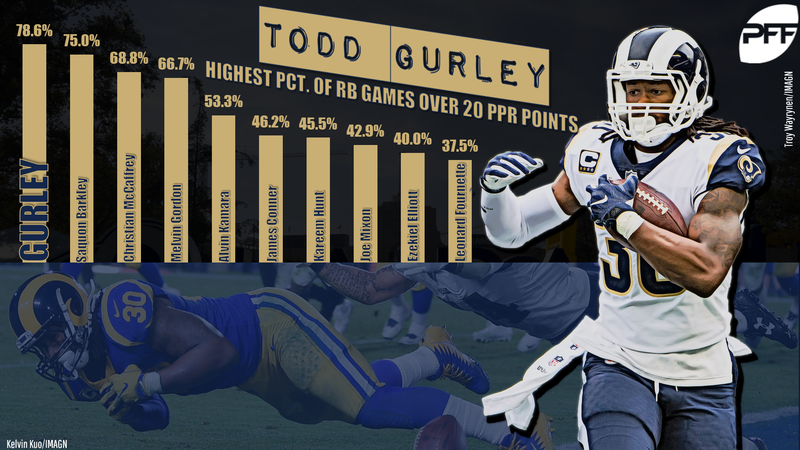 Whether injury-, performance-, or something-else-related, the frustrating end of Gurley’s season is what we remember right now, but it’s important not to forget that he topped 20 PPR points a whopping 11 times before that disappointing bit at the end. That’s incredible, and considering he has led the league in PPR points per game each of the last two years, he needs to be near the top of every draft list still. Gordon’s problem has actually been injury; he’s played all 16 games only once in four seasons and has missed a total of nine games around that. That’s not damning, but when we’re looking at the top tier, it’s a definite factor. Still, when he’s played, he’s hit the elite threshold more often than any running back but Gurley, Saquon Barkley, and Christian McCaffrey. Like Allen above, Kamara’s is even more interesting when breaking it down. During Mark Ingram’s four-game suspension, Kamara hit 20 PPR points three times in four games, with a 34-point game and two at 41. Once Ingram was back, Kamara’s rate dropped to a still-impressive 45.5%. If Ingram’s back in New Orleans in 2019, Kamara’s an RB1. If Ingram’s gone, Kamara might be the RB1. Fournette hasn’t been special as an NFL player, but on a Jaguars team that hasn’t had much to surround him with when he’s been active — and is likely losing T.J. Yeldon and Carlos Hyde this offseason — he’s likely to continue to get massive workloads, and massive workloads can translate to massive fantasy performances even if the player is only so-so per carry. The knock on Jones in recent years has been that he’s been too big-game dependent, packing a sometimes-frustrating percentage of his season-long scoring into just a few weeks. For a receiver scoring three or four touchdowns a year, that is a legitimate complaint. But if Jones is going to score eight touchdowns like he did in 2018, that’s a boon. His best-ball stock is high. Before the Vikings’ bye: seven times in nine games. After: once in seven. Did something happen to Thielen down the stretch? Did the teams figure out the Viking offense? Did he get tired? If you believe there was something materially different, Thielen might carry a warning light in 2019. Me, I think that was largely random, and he’s an elite option. 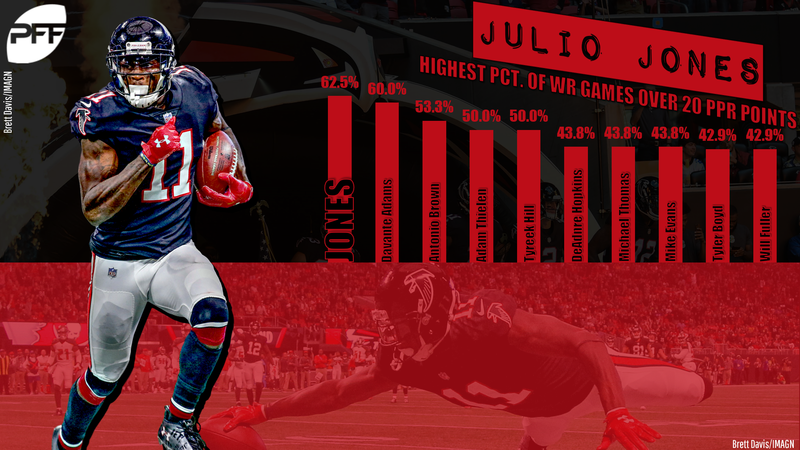 Hill was the quintessential best-ball receiver in 2018. He scored 30-plus four times, 20-30 four times, 10-20 five times, and under 10 three times. You loved him a lot of the time and he might well have been on your best-ball bench in others. That’s more or less the exact player you want. The Fuller/Deshaun Watson connection is still incredible. They played four games together in 2017 and Fuller topped 20 twice (scoring 19.9 in another). So combined the two years with Watson and let the 19.9 round up, and he’s hit the mark six times in 11 games. Injury is always going to be a concern with Fuller until he shows he can play a full 16 — you’ll want to pair him with some more reliably healthy options on your best-ball roster — but the upside is enormous. This shouldn’t be a surprise. 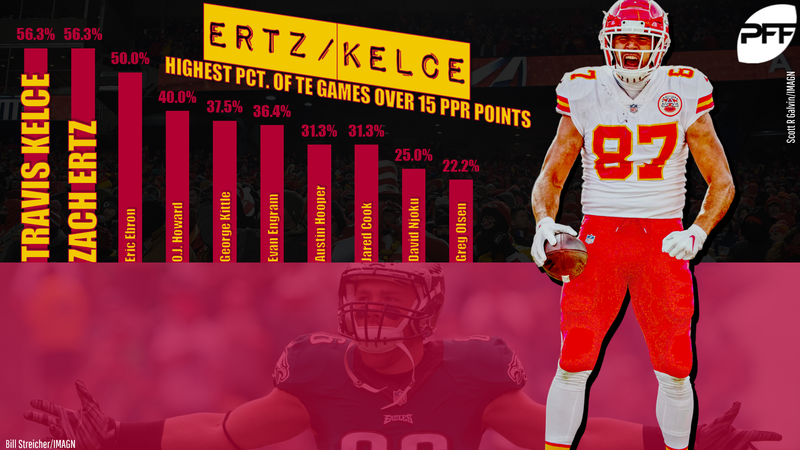 The two elite-of-the-elite tight ends had the best games the most often. They’ll go 1-2 in drafts of all kinda at the position. They should. I can very much feel myself going hard in on Howard in 2019. He was on his way to an easy TE1 season in 2018 before his injury, and that was with uncertainty at the quarterback position, Cameron Brate stealing some targets, and Adam Humphries and DeSean Jackson in the receiver corps. The first of those is unlikely to repeat, Humphries is a free agent, and Brate and Jackson are both potential cuts. The top tier at tight end, depending how you define it, goes about four deep in 2019, but Howard should make it five.